Art I've come across that touches the heart of our Father God. 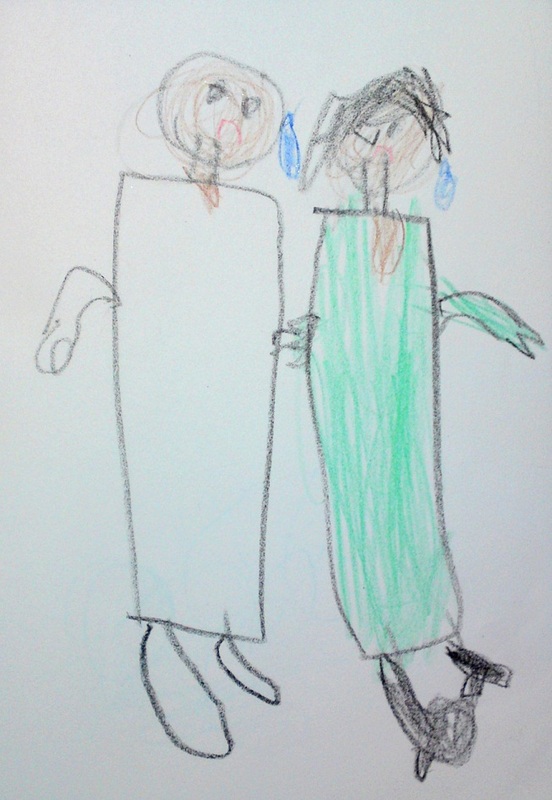 Daddy has these people in His heart, and their beautiful masterpieces on His refrigerator. I thought the picture was beautiful and moving, and showed a tenderness I couldn't put into words... especially if you think of the big hand as God's hand. Fast-forward four years to the 2011 earthquake and tsunami in northeastern Japan. A few months after the disaster I felt called to go to Fukushima and paint pictures for disaster survivors, particularly for nuclear refugees. I would pray for someone and God would give me a picture. Sometimes it took some time as I asked God what to paint. Once when praying for a pregnant woman, God told me to paint the picture that the pastor's wife had painted in 2007 and give it to her, and to add the scripture from Jeremiah 1:5 -- "Before I formed you in the womb, I knew you." I painted as quickly as I could while the mother was getting supplies with her mom outside, and then I had a fellow volunteer give it to her (because I had to work on another person's painting). When she read the verse she exclaimed, "The Bible really says that??" In later trips volunteering in Fukushima, I was impressed to paint that picture again four more times (one with a cute variation) for four more mothers! I just love how God works! That original painting made by the pastor's wife... she had no idea that it would go all the way across Japan to be a blessing to five different mothers and their families, to let them know how God loves them and their children even before they're born! 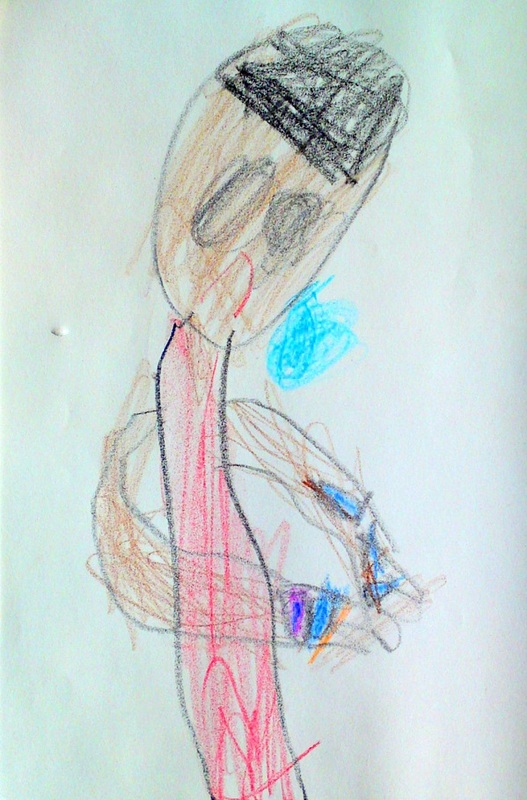 I spent some time drawing with my daughter Joanna shortly before she turned three years old. She loves drawing, but her progress has been a bit slower than Timo. She's actually incredibly focused and persistent, but very stubborn and only wants to do what she wants to do, haha! She wanted another heart, and I put that in the middle. Then I think she fed me some colors and asked me to do something else, and in that way I did the pictures surrounding the heart with the colors she gave me. I just wanted to paint something cute that she could understand, and didn't plan on what I was going to paint. But the result really looks like it had been planned, I think! It turned out to be quite a picture of God's love! 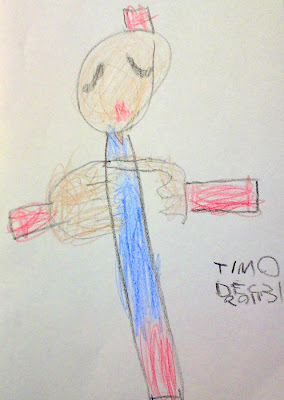 Timo asked me about a picture I did yesterday, of Jesus on the cross and the two rebels on either side of him. I quickly hid the picture from him at the time yesterday because I didn't want to tell him about the painfulness of that... I told him I'd explain it later. Timo paused, puzzled, and asked how Jesus stayed on the cross. I paused, too, before deciding to just tell him about the nails. It hurt a lot. And actually, Jesus is God, and so He's strong, stronger than any Ultraman or anything. So He didn't have to stay there on the cross, but He loved us so much that He wanted to take our punishment for us. So He stayed there, died and came back. (Of course Timo asked other practical questions like, "How did He get off the cross after that?") I told him that when we see scars on hands we think "Ouch!" and the pain, but when Jesus sees the scars on His hands He thinks of us and loves us! So I ran to go show him one of my pictures with the hearts on Jesus' hands, but Timo beat me to it and said, "That's why He has the hearts on His hand." I asked him why he put the blue on Jesus in the middle. He said he didn't know, haha. Just because the blue was there. I told him that sometimes we talk about Jesus' love like water... but maybe that was too deep for today. Last night I was watching a year-end special on TV about the March earthquake and tsunami, and my son Timo (4 and a half years old) was watching some of it with me. Back in March when we were watching the tsunami on TV, I decided to let Timo watch sometimes and explain to him what was happening, and tell him how it had to be hard for the people. So when we saw it again on TV last night, he started drawing pictures of it! 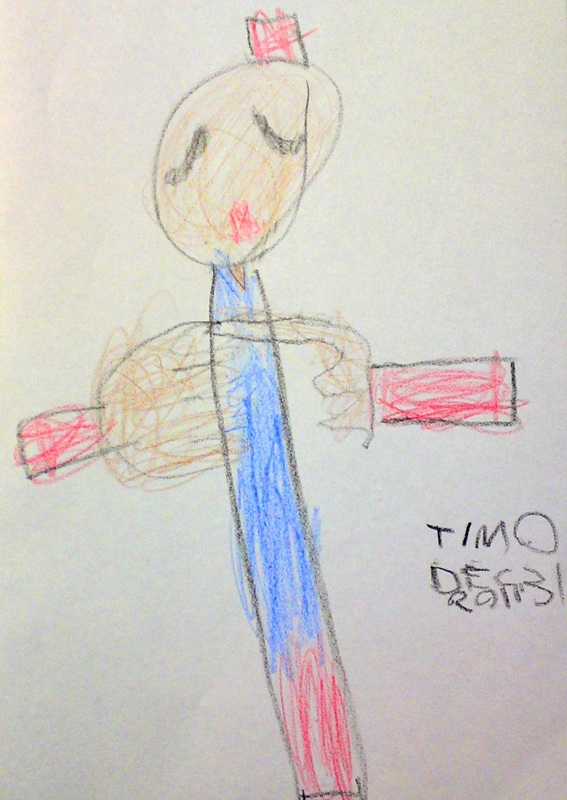 Timo drew a picture of Jesus crying and holding broken buildings. I was surprised and moved by what he drew. It wasn't what I suggested he draw, and that's good, actually! Instead Jesus showed Timo that He understands our pain and cries with us. And that was one of the reasons that I was letting Timo watch some of the tsunami on TV alongside me was so that he could understand a little of what people were experiencing, so he could sympathize with them, and later on, so he could understand why Daddy left sometimes to go to Fukushima for a little while.